prehm modellbahn shop - Art. Nr. 500600 - worker with pallet truck &#8211; called &#8220;ant&#8221;, The worker and the pallet truck are both made of metal and painted in weatherproof colors. An interesting addition to any industrial business (for example sawmill, brewery), railway station or coal shop. 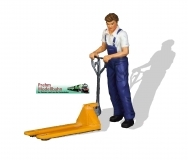 The finely detailed and hand painted model of the pallet truck has a movable drawbar. The worker and the pallet truck are both made of metal and painted in weatherproof colors. An interesting addition to any industrial business (for example sawmill, brewery), railway station or coal shop. The finely detailed and hand painted model of the pallet truck has a movable drawbar.. This Product was added to our catalogue on Thursday, 07. February 2019.
for more information please click on DETAILS! The rowing boat in plastic is suitable for driving further over the lake and fishing there in the area of life of the schools of fish. For more information please klick on DETAILS! The well-known chimney sweep is now supplied in metal. For more information click on Details! Suitable for the rowing boat is the seated angler made of metal.